Where is that very special deer hunting area, where the deer are big, plentiful, and the competition from other hunters is light? When you find out, please let me (and only me) know, will you? 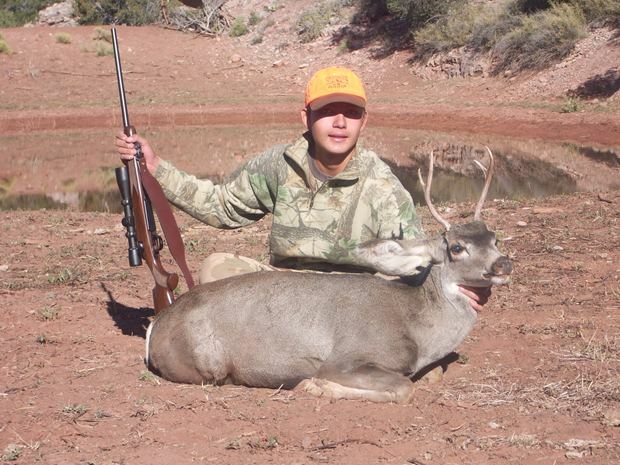 I’ve recently decided to stop hunting deer in my favorite whitetail unit near Nogales, because the illegal immigrant situation is just getting crazy down there. For the last couple seasons, I’ve been in search of a good, but relatively unpressured unit to chase mule deer instead, well north of the border troubles. Last year my search led me to the Flagstaff area. Ray Cernansky and I saw plenty of deer, but the over-whelming majority were antlerless. What bucks we did see were yearlings. Plus, I would not characterize the area as unpressured! This year I threw the dice and put unit 17A down on my hunt application for first choice. Sam, my 13-year-old, also wanted-in on the hunt. Already an experienced doe and cow elk hunter, Sam wanted to tag his first buck. 17A is a small unit northwest of Prescott, north of Camp Wood. I knew next-to-nothing about the area when we applied. I had been near the unit maybe twice before, but not in the unit. So when we were drawn, I knew we had a lot of homework (scouting) to do before opening day. But life being what it is, we got a chance to run up there on only two day-trips to scout. What we found was thick juniper forest everywhere we looked. On our first trip, we took a walk into the junipers in a still-hunting mode. After only a short time, we did indeed find a buck. We only caught the most fleeting glances of him as we tried to follow. He didn’t run madly away from us, but he was quick enough, and the trees were thick enough, that he disappeared after only a few flashes. So we determined that the deer were definitely here, but the hunting would be tough. Before our second trip, we scoured the topos looking for areas of openness where we would have a chance of employing my favorite tactic: sitting all day on a high point where a 200 yard poke could be made when a deer finally appeared. There were only a few such spots in the areas we were focusing on. One promising-looking spot involved a 1¼-mile hike in from a rough powerline road. This area was about two miles west of the area of the deer sighting on our first scout trip. That high spot over an open valley was our primary goal for the second scout trip. Our other goal was to identify suitable camp spots. After parking the Polaris huntin’ buggy where the powerline road topped a ridge, we set out on our hike. Further encouragement of the area’s potential for deer was found about half-way to our goal. It was a real nice 4 point shed antler. So basically, that settled it. We had found an area to hunt, and we had found a couple suitable camp spots near the powerline on this scouting trip. So our first day’s plan was to drive the buggy up to the ridge top and to just spend the day hiking to, and hanging out at the high vantage to see what would transpire. On the hike to and from, we stopped and sat at a couple smaller openings for short times. While traveling, we walked very slowly, as a deer could literally be behind the next tree. By the time we got back to camp on the evening of opening day, we had not seen any deer, nor even heard any shots. We were using our matching Browning A-Bolt Micro Hunters – Sam’s rifle in .260 Remington, mine in 7mm-08. Both wore fixed 6-power scopes. These rifles seemed perfectly suited for the conditions we faced. Short, light, and quick to point if we should walk into a deer at short range in the thick stuff, yet perfectly capable of making the longer shots if our plan for the high point worked out. We pretty much repeated the same plan on the next day with the same results as the first. On day three, we decided to split up in the morning. I would take the buggy back up to the ridge top and hunt the morning as we had been doing for the previous days, while Sam would stay lower and still-hunt the ridge where we had seen the buck on our first scouting trip. The plan was to reconnect back at camp at lunch time. Somewhere around 10:30, I got fed up with not seeing any deer on the ridge and decided to head back to the buggy to do some exploring. I headed further away from camp on the rough powerline road. About three miles along, I found myself in a very open rolling grassy valley. Surrounding the valley were ridge tops thick with juniper. It was quite a beautiful area that looked like it had definite possibilities for deer sniping. From looking at the topos, I knew that there was supposed to be a stock pond back here, somewhere. After taking a few turns, I found the tank. At first sight, I thought it was dry as a bone. But after a little more putt-putt-ing, I found out that it was a double-tank, and that the upper tank held water. My mind flashed back to a particular sentence on the hunt unit description on the Game & Fish website: “During the early archery season and the general season, sitting on waters can be a productive tactic.” There were several tanks near where we camped, but they were on the main access route to the area, and I didn’t think much about sitting on them to wait for deer. This tank was in the way-back and seemed like an ideal spot to sit and wait. There were no vehicles on my way in, and no one yelled at me when I pulled up in the buggy, so it looked like no one had claimed this tank so far during this hunt. So I turned around and headed back to camp to tell Sam about what I had found. We returned to the tank after lunch. Across the pond from vehicle access, the tank was hemmed-in by a tall cliff. I suggested to Sam that he find a spot up on the cliff to sit until sundown. I was going to hike around the edges of the grassy valley and in a flat above a nearby canyon to explore the area a little. I had a great hike, but saw no deer by the time I met back up with Sam at the end of the day. He told me that a herd of does and fawns (13 total) did come in to water late in the day, but he saw no bucks. This was great news. At least we knew that deer were actively using the tank. He also told me that it had gotten awful hot up on the cliff for the hours he sat. Unfortunately, the cliff had a southern exposure. It turns out that there were several blinds set up around the tank, that I hadn’t noticed in the short time that I had been there. For some reason, we got a late start the next morning. We got to the tank about 8:30 with the sun already high. I wanted to sit the tank with Sam today, so that I could see the deer too! We started by checking out the pre-existing blind on top of the berm next to the cliff. Sam passed this one on his way up the cliff the day before. This blind was basically an open ring of logs and branches. Since it was next to the cliff, it also suffered from the southern exposure problem. But I could see definite possibilities here. Sam and I started by enhancing the cover – bringing in new logs and branches. Then, facing the water, I erected two thick forked branches vertically, on top of which, I laid another log horizontally. This created a window facing the water. 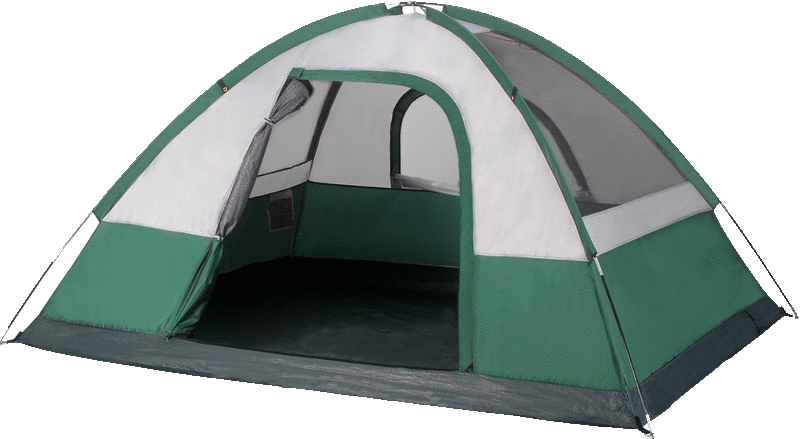 Anticipating that we would need some artificial shade, I had brought a camo tarp and some cordage. 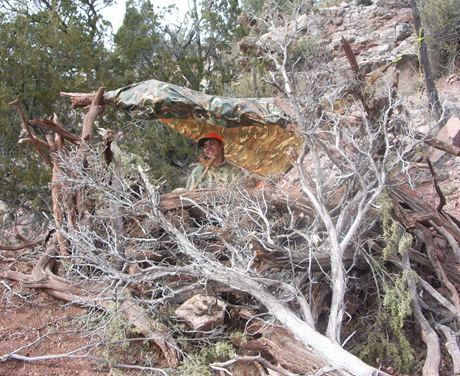 I wrapped one edge of the tarp around the top-of-the-window log, pulled the tarp over the blind to create a roof, then anchored the back of the tarp to a fence and to some rocks behind the blind. Very nice! Now here was a place that we could very comfortably spend some long hours. 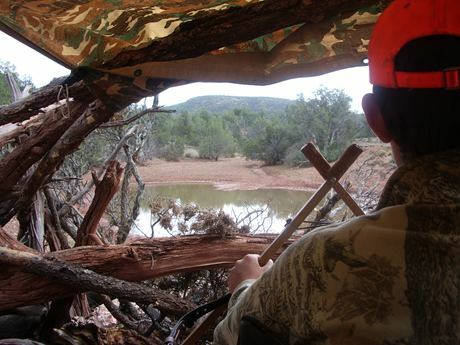 With Sam seated in a camp chair, and with me seated on a pad on the ground, both of us were able to fit in the blind. My primary mission for this hunt was really to see Sam get his first buck. Sure, I’ve still got room on my wall for a nice 4x4 set of mule deer antlers, but chances were a lot better that we’d first see a nice forkhorn for Sam. Well it sure seemed like a good idea, didn’t it? We sat the rest of the day in the blind, with no further deer sightings. But it was a good time hanging out together. The next morning we decided to again split up. We left camp in the pre-dawn darkness to head to the blind. By the end of the hunt, we were getting quite familiar with the powerline road between camp and the blind! The distance was a little over four miles. The ugly road was actually kind of fun to run in the Polaris Ranger. We still figured that the best chance was at the blind. I dropped Sam off there, while I was headed to a high ridge overlooking a semi-open area of the grassy valley, about a half-mile away. The weather really was great on this hunt. There were no storms for the duration. The afternoons heated up nicely into the high 70’s, but the mornings were cold – in the 30’s. Both of us did our best to keep comfortable until the sun came up. As the sun rose, I glassed the valley down below me hard for any sign of movement. “Hang on. I’ll be there as soon as I can!” I gathered up my pack and my rifle and scurried down ridge to where I parked the Ranger. I loaded up the buggy and headed over. Sam was still sitting in the blind when I pulled up. I was all ready to drive down into the tank area to go pick up a deer, but Sam waved me to a stop. OK, his show. I waited on top of the south berm while Sam made his way up-draw to where the deer lay. Soon enough, he had verified that the buck was down for the count and he waved me in. I drove down and saw the buck for the first time. He was decent young forkhorn. And it turned out that Sam was more excited than he was letting on. Sam said his buck had come in with another smaller buck and a bunch of does. We took a few pictures of the successful hunter then decided to move the buck away from the tank to take care of the red work. No sense in mucking up a good hunting spot after all! As Sam opened up the deer, it became evident that he didn’t exactly make the best shot. It was a gut shot. However, the damage done by the 6.5mm 120 grain Nosler Ballistic Tip bullet was extensive. The deer was an ugly mess to field dress. I was glad that I only had to supervise! We took the deer back to camp where we hung him up, cleaned up, and had lunch. I then helped Sam get started on the skinning duties and gave him some suggestions on further cleaning the meat, now that we had access to more clean water. Since Sam had things under control at camp I headed back once again to the blind. That evening proved to be a bust, as did the next morning. There were still a few more days left in the hunt, but we already had one buck that needed to get to a freezer. When we got back home, we compared Sam’s horns to my first deer. His was bigger!